Who doesn't love Halloween? Answer: Probably your pets. Many types of costumes are uncomfortable for them, the commotion is either way too exciting or somewhat upsetting, plus smells. A lot of stra ge smells. Odds are though, even if you've thought about the reasons why your pets might not like Halloween, you haven't opened the emotional Pandora's box of the reasons why it could be dangerous for them. 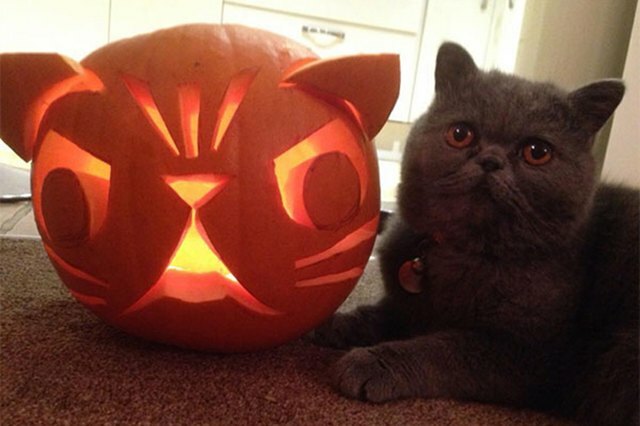 Here are 13 somewhat unexpected Halloween dangers that could be harmful to your pet. Keep them in mind, and keep your pet safe. After all, safety first (especially when it comes to our furry family members). We humans know to keep our paws off of the flames, but for a pet a candle inside of a pumpkin could very easily seem like a new toy. Burns could very easily ensue. Even if your pet knows not to go after the flame, they could inadvertently knock it over, which poses a risk for house fires. It's totally adorable to dress your dog as Lady Gaga or your cat as a business man, but make sure their little costumes fit them comfortably. More important than physical comfort, the ASPCA says we shouldn't put our pets in costumes unless we know they totally love it, otherwise they can get supremely stressed out. If they do wear a costume, make sure it doesn't constrict their movement, breathing, barking, or meowing. Also, if they seem distressed in their costume, take it off immediately (you'll probably have time to snap a pic for posterity) — and maybe opt for a simple bandana. Okay, so you have one of those pets who loves to be in a costume: You should still never let them hang out in their costume unsupervised. Check the costume for pieces that are dangling or could be easily chewed-off, these items can very quickly become choking hazards. If the costume is too loose, pets can also get tangled up in it or stuck. 4. Going out without proper I.D. If you're taking your pets trick or treating, make sure they're wearing the proper tags. With all the commotion on Halloween night, it's possible that even usually well-behaved pets could run off. Be sure they are wearing the proper tags with current IDs (or that they're microchipped). Something your pets never ever need to eat: candy. In addition to what you're already thinking of, artificial sweeteners like xylitol can also be really toxic to animals. Keep your stash hidden. Furthermore, if you have pets and kids make sure the kids know not to give the dog a candy bar. They might think they're simply sharing, but it could be a disastrous mistake. You know about this one already but it's really serious. Don't let your pets (especially your dogs) anywhere near chocolate eating distance. All types of chocolate is toxic for dogs. If your pup has accidentally ingested some, immediately call your veterinarian or the ASPCA Poison Control Center (888) 426-4435. We all know those healthy families that like to hand out raisins in lieu of candy. While they might think they're sparing us cavities, they probably don't realize they're setting a small pet booby trap. Raisins can be toxic for some dogs, and can make most dogs very sick. You may think that once the candy is all gone it is no longer a threat, au contraire. Wrappers will attract your animals because they will still have traces of food on them. These wrappers are serious choking hazards. Make sure to dispose of them properly. Glow sticks, fake blood, and other decorations may make for fun accoutrements, but they are choking hazards for your pet. When it comes to glow sticks and fake blood, they could also be poisonous. Be careful what you leave out and where. Wires and strung lights should also be kept out of a pet's reach. Wires are just too seductive to chew on and strung lights are easy to choke on or get tangled in. Your best bet is to keep decorations out of your pets way. There's a reason your pets hide under the bed during thunderstorms and fireworks shows, noise can be very stressful for them! If you're planning on having a big party (or even just lots of trick or treaters) consider keeping your pet in another part of the house so they don't have to endure the din. Another reason to keep your pets tucked away, on Halloween (especially) the front door gets opened and shut a lot giving them ample opportunity to scamper outside. If you're passing out candy, make sure you know where your pet is at all times (and as we said before, make sure they've got their collar on). This is a sad one but Halloween is a favorite time for pet pranks. Avoid all of the nonsense by keeping your pet indoors on Halloween, particularly if you happen to have a black cat. Black cats are particular targets for abuse and pranks this time of year. So even if you have an outdoor pet, just bring them inside for the night.